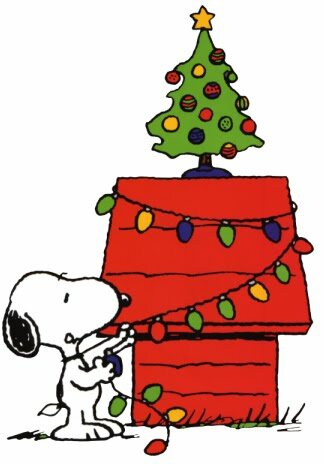 Join Ward 5 Councillor Ed Sleiman for the annual tree lighting ceremony. Enjoy caroling, Tim Horton’s hot chocolate & coffee, Christmas treats and craft sale. Event is free, all welcome! On November 3rd the Ford City community came together to hear the results of this past summer's Community Conversations project.The report is available for download on the right side of the top of our blog under Envision Ford City. The Community Conversations brought Ford City community members together to discuss questions such as "what do you love about Ford City", "how would you like Ford City to be know in 10 years", and "what could be done with vacant land or property in Ford City". Groups of participants sat around small tables with a hot cup of coffee, a snack and the company of fellow community members to discuss their answers. Project staff recorded answers and complied data. After an analysis of themes and answers a report was produced to summarize the results and 35 recommendations were generated. 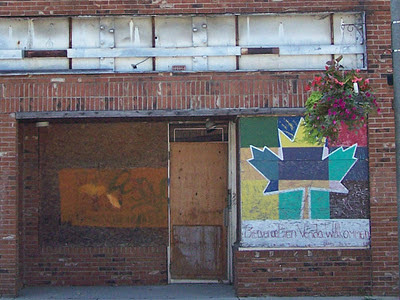 These recommendations will inform the work of the Ford City Redevelopment Committee, the Ford City Neighbourhood Renewal Project, the Ford City Residents in Action, the city and other organizations with a stake in the area's revitalization. We would like to acknowledge and thank the Canada Mortgage and Housing Corporation for their support of both the Sharing Our Vision Forum and the Community Conversations project. We would also like to acknowledge CMHC for their contribution of a shed for the Ford City Community Garden in the summer of 2011. On November 4th The Ford City Listening & Learning event, held at Atelier Virginianne 1078 Drouillard, showcased the photography of residents, a visual representation of the parts of Ford City that speak to their experience living there.The event also featured works from members of BCL such as "Make This Better". About 100 guests enjoyed the art, live music and participated in the silent auction of the photos. 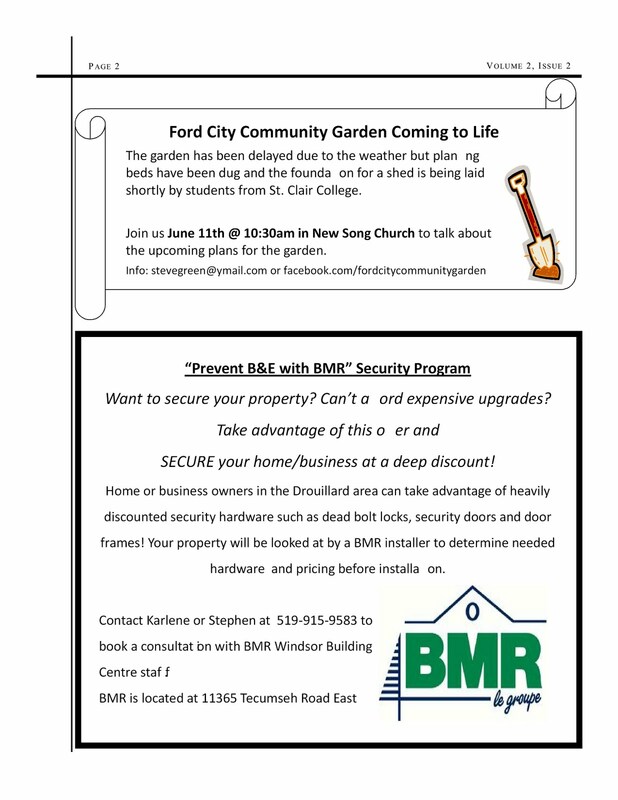 The money raised from the event went towards the activities of both the Ford City Residents in Action and the Ford City Community Garden. This event also marked a first for Ford City; the opening of an art studio and workspace called Atelier Virginianne. The space features a large work area and kiln that can be rented, and Virginianne herself teaches lessons here. Thank you to all who attended. 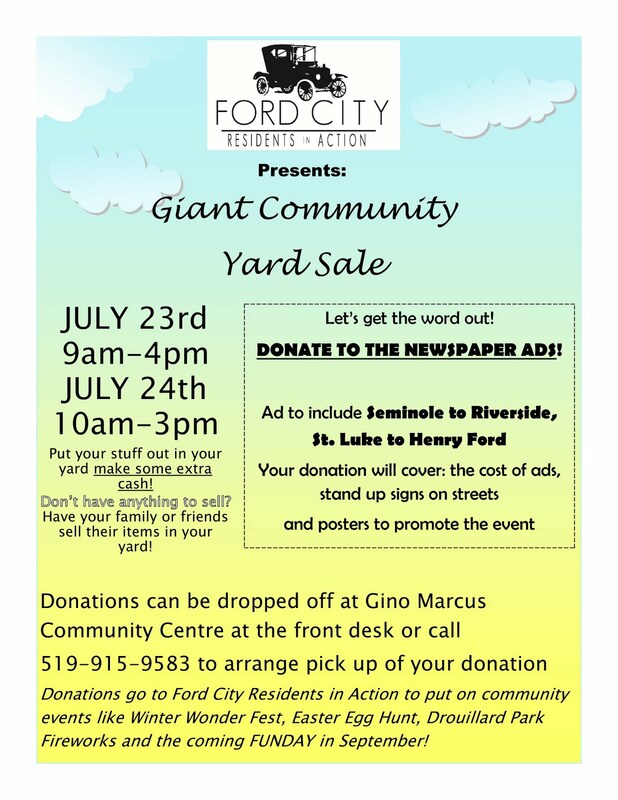 Your support is vital to the momentum of Ford City. Click the posters to enlarge. Visit http://www.eventbrite.com/event/2321555836 for more info! Paint the Towne-Site 2-Part 2 "Beautify"
Our second Paint the Towne site has evolved.....a local artist has been up to "all good" by beautifying the store front with her artistic prowess. Although not completed, what do you think?? Paint the Towne Strikes Again with Site 2 Refresh! The second 'Paint the Towne' site was refreshed today with a coat of primer. Shortly a local artist will begin putting on the finishing touches with a neutral design....so stay tuned! Wouldn't it be wonderful to see a brand new accessible all-ages park space at the Gino & Liz Marcus Community Complex on Drouillard??? Please check out our idea and vote daily. Together we can make this happen! ROUND 2 begins October 24th so vote once a day! Thank you! Paint the Towne Rolls On! On August 30th we first wrote about our Paint the Towne project and we told you to stay tuned.....well here is the latest photo of the building. 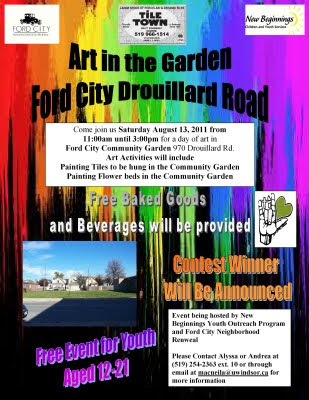 Thanks to New Beginnings, and in particular their youth outreach worker Toni Soldevilla, the building is proudly displaying artwork painted by neighbourhood youth at the Ford City Funday event that was put on Sept 3rd by the Ford City Residents in Action. Stop by sometime and have a look at the artwork. If your child was one of the artists maybe they can point out which part they did! A big Ford City thank you goes to New Beginnings for helping us further beautify this building with your donations of time and materials. FUNDAY was back this year, and better than ever, to celebrate the end of summer and the return to school! With the help of sponsors and volunteers FUNDAY provided everyone in attendance with FREE food and entertainment. Funday included: jello eating contest, tee ball game, bird house building, water balloon toss, canvas painting, face painting, historic walking tour, bouncy house, live music and more to Ford City residents. The Ford City Residents in Action thank all who attended the family funday! They would like to thank all the volunteers who worked hard in the heat to put on the event. A big Ford City thank you goes out to the sponsors: Local 444, Local 2458, Local 200, Excess Metals, Metro, City of Windsor, New Beginnings, YU Express, Windsor Family Credit Union, Champion Products, Windsor Taxi, Mainsonville Court, Long & McQuade, Canada Bread, Lowes, Drouillard Place, Windsor Fire & Rescue, Windsor Police Services and Computers for Kids. Paint the Towne Site #1: Getting Fresh! 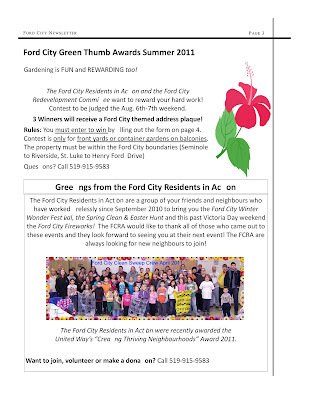 On August 25th the Ford City Neighbourhood Renewal kicked off its Pain the Towne program. Thanks to a partnership with Drouillard Place Teen Centre, who sent us two excellent painters, it only took 4 hours to scrape the paint and put on two fresh coats of white primer. for sponsorship of this program. Thank you to Browns Lounge for use of their ladder. Thank you to Canadian Salvage for donating the paint rollers. 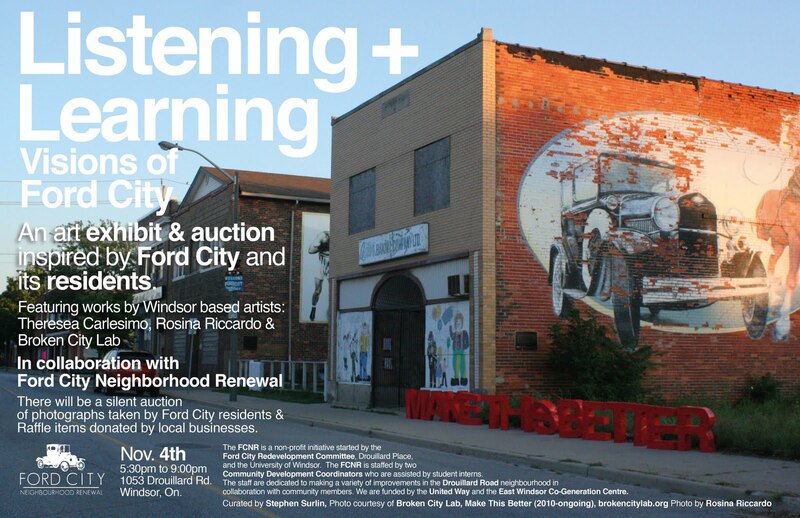 Update: Check out the Windsor Star Article Called "Ford City Gathers For Art's Sake" here, published August 15th as a follow up to the event. 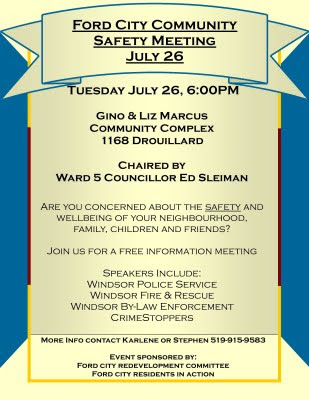 Hosted by your Ward 5 Councillor Ed Sleiman-Come on out and hear from Windsor Police Services, Fire & Rescue and others about how to remain safe, what to look out for and what to report. There will be time for Q&A. This event is free. All public welcome! See you there! Want to secure your property? Can’t afford expensive upgrades? Take advantage of this offer and SECUREyour home/business at a deep discount right now! 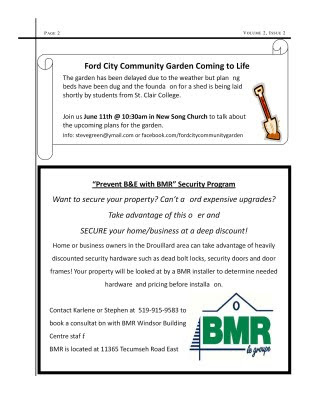 Home or business owners in the Drouillard area can take advantage of heavily discounted security hardware such as dead bolt locks, security doors and door frames! Your property will be looked at by a BMR installer to determine needed hardware and pricing before installation. Funding is limited so act quickly to take advantage of this offer! 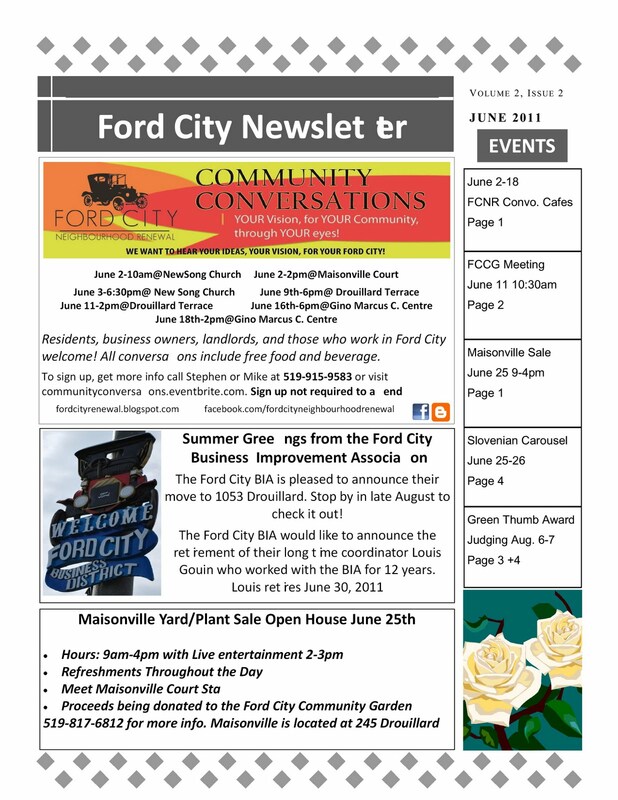 June 2011 Edition of Ford City Newsletter Hitting Mail Boxes Soon! 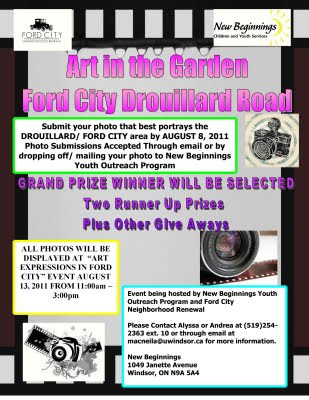 Check Out the Action in Ford City! If you do not receive a copy in your mail please stop by Gino & Liz Marcus Community Centre for a copy later this week. 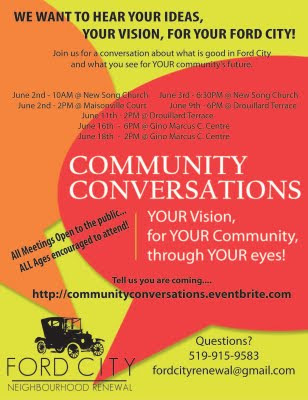 Envision Ford City is a community wide conversation to talk about what is good in Ford City and what YOU, the residents, property owners and community leaders want for the future of your community! Community Conversations is NOT another meeting to talk about what is wrong or bad in the community. Nor is it another meeting to talk about some else's plan for Ford City. It IS about your family, your home, your business, your future, your vision, your ideas! 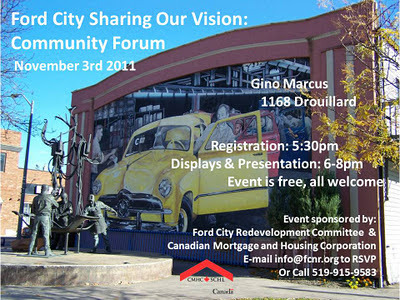 We want to hear YOUR ideas, YOUR vision, for YOUR Ford City. Please join us for any one of the sessions listed! 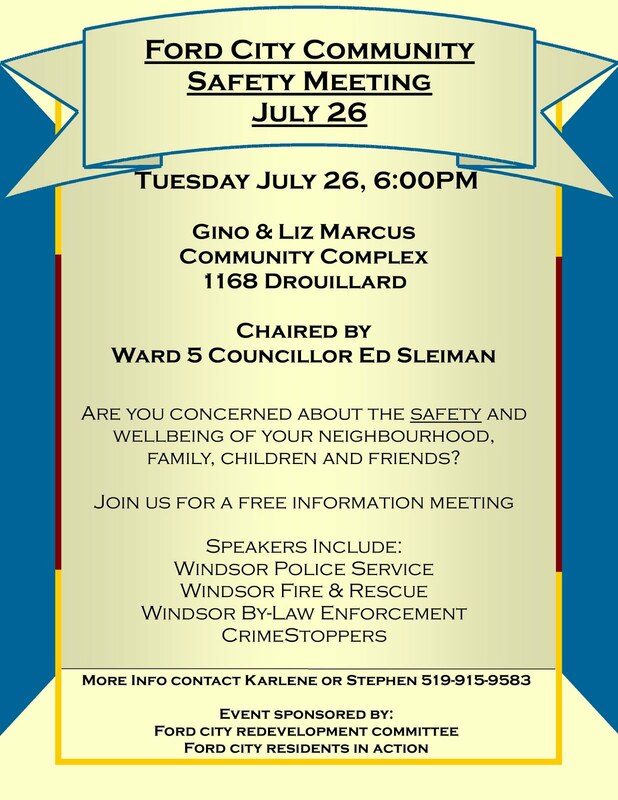 All meetings are open to the public and ALL AGE are encouraged to attend. Refreshments will be provided and childcare is available at most locations. There is a Brazilian proverb that says "when you dream alone, it remains just a dream. When you dream together, it is the beginning of a new reality." 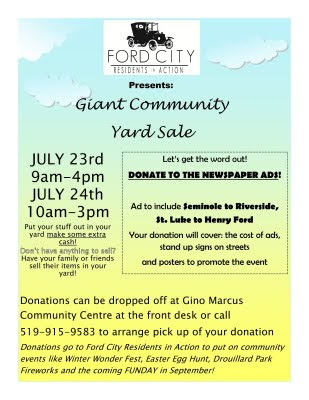 Please come and help us begin a new reality for Ford City! Click here for a PDF version of the poster. Ford City Residents Bring Back the BOOM! 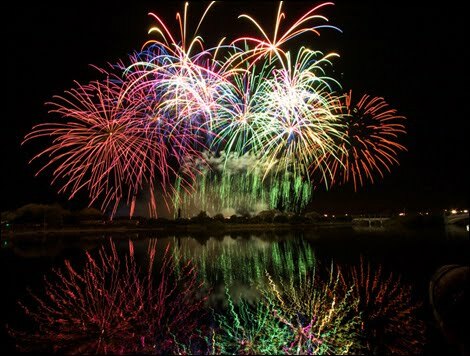 The Ford City Residents in Action (FCRA) are bringing back the BOOM with the return of a community fireworks display on Saturday, May 21st in Drouillard Park. This FREE event, which is supported by the Ford City Redevelopment Committee, will provide families with live entertainment, face-painting, and of course the fireworks! Food and drink sales will help support future community events. Everything starts at 6pm and wraps up at 11pm. 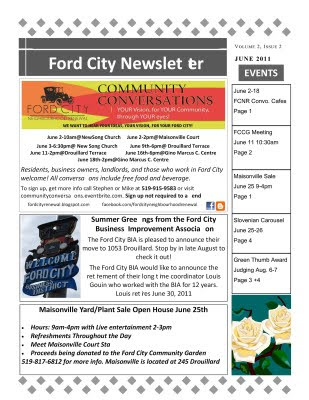 This event is just one of the many signs that great things are happening in Ford City. The Residents in Action have worked tirelessly to prepare a night of family friendly fun and entertainment. You don’t want to miss It! 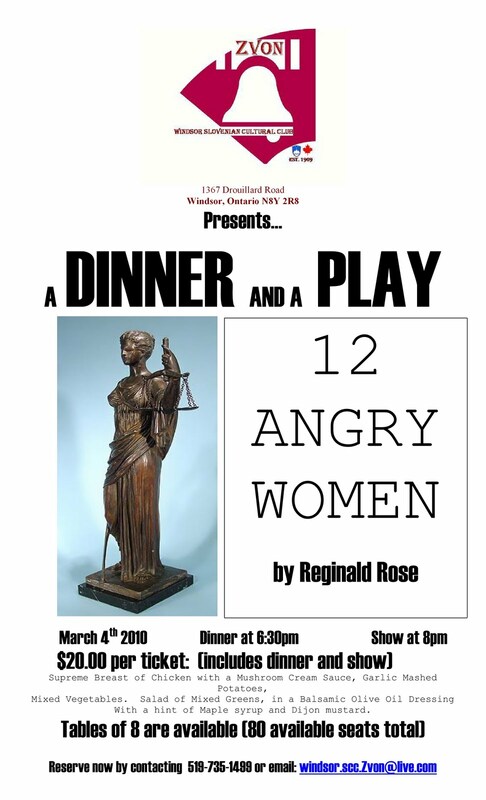 Time: 6:00 p.m. – 11:00 p.m.
Purpose: Build community spirit and raise funds for future community events. Includes: Live entertainment, food concessions, and fireworks! The Ford City Residents in Action are the 2011 winners of the United Way’s “Creating Thriving Neighbourhoods” award. This voluntary committee, made up of Ford City residents, is determined to improve the quality of life in Ford City for all residents. They are also committed to the creation and implementation of family friendly events that create opportunities for individuals to meet their neighbours and engage one another to experience their community. A recent Windsor Star article showcased two new businesses that are located in the 1600 block of Drouillard Road. LeeAnn Walmsley opened Magic Hair Salon in January at 1657 Drouillard and Jay Sales plans a June 1 opening for his restaurant next door. Both Walmsley and Sales love the Ford City/Drouillard Road area and are exciting about being apart of the revitalization efforts taking place here. We're happy to have both their businesses on the street and look forward to doing our own spotlight on them in the months to come. The Clean Sweep/Easter Hunt is canceled for tomorrow due to rain and will be held this SUNDAY APRIL 17TH instead! Please let everyone know! Sunday April17th the clean sweep will start at 9:45am in Drouillard Park, followed by a free pizza lunch for participants. At 1:30pm the Easter Egg Hunt starts in Drouillard park for grade school aged children and under. Hope to see you all there! 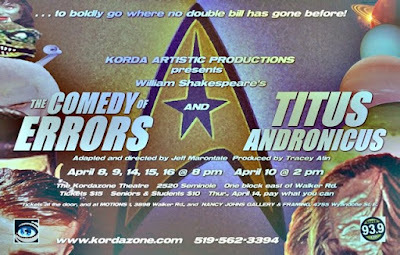 More Theatre In Ford City: Kordazone Double Bill! You might be thinking what can i do this weekend? You might be joining us for the Ford City Clean Sweep this Staurday and be looking for some entertainment afterwards.......well why not visit Kordazone Theatre on Seminole in historic and interesting old Ford City? 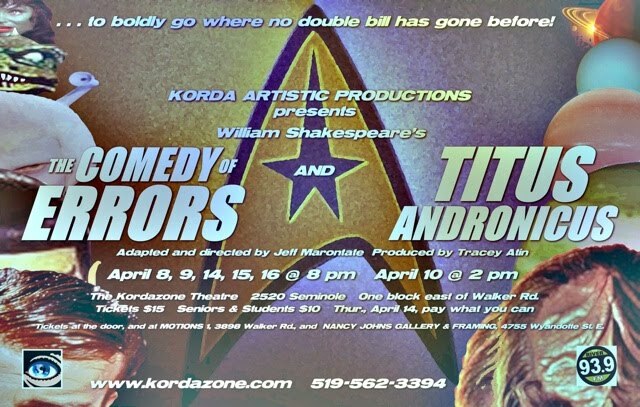 They will be featuring this Shakespearian Double Bill which looks outta this world! Check out their website or call 519-562-3394 for more info. 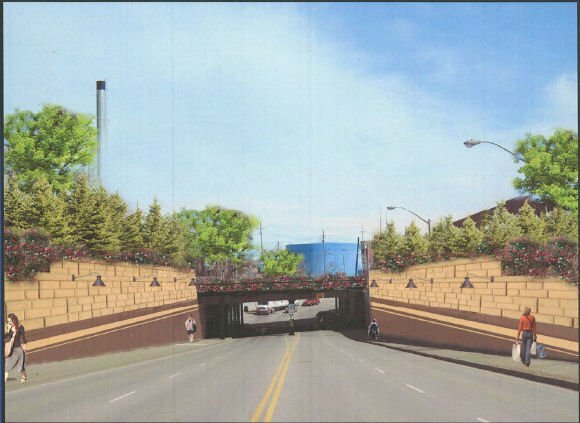 Check out the city's proposed plans for a Wyandotte facelift that includes the Drouillad viaduct! This illustration is featured at the bottom of the linked Windsorite.ca page above. What's better than LIVE theatre? When it comes with dinner!!!! March 4th @ 6:30pm. Tickets are $20/person and can be reserved by calling 519-735-1499 or emailing windsor.scc.Zvon@live.com. Located at 1367 Drouillard Rd. Dinner features Supreme Breast of Chicken with a Mushroom Cream Sauce, Garlic Mashed Potatoes & Mixed Vegetables. Salad of Mixed Greens, in a Balsamic Olive Oil Dressing with a hint of Maple syrup and Dijon mustard. Check out this cool video of many different cities brightening up their communities with paint, could we do this in Ford City? Where? Let us know. Dulux Walls was the film element of the Lets Colour Project. 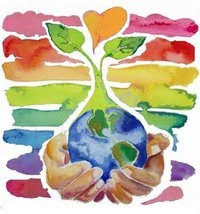 A global integrated campaign, who's mission was to bring colour to peoples lives. Together with local communities we transformed areas of Rio de Janeiro, Paris, London and Jodhpur. For rent, is one of four freshly painted vintage one bedrooom apartments that have new laminate floors. 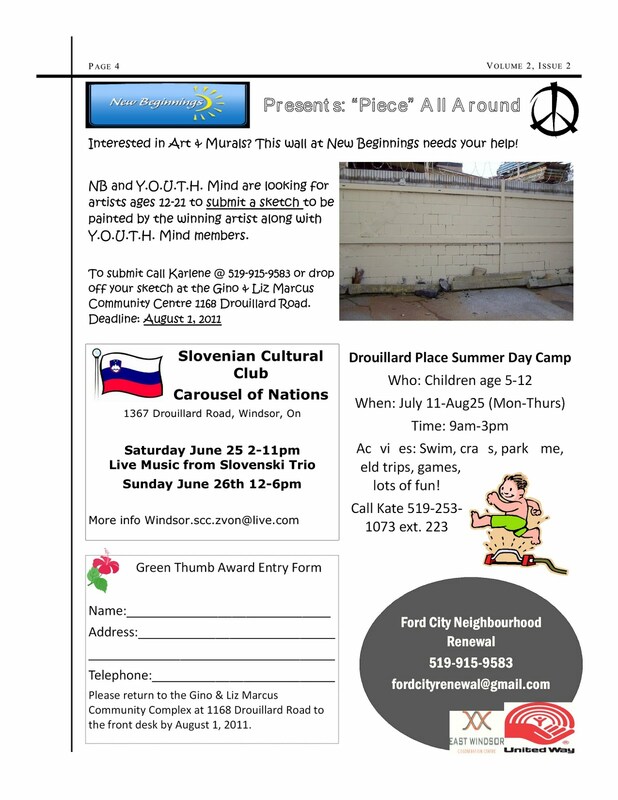 They are above a 4,000 square foot Artists Workshop in Trendy Old Ford City at 1080 Drouillard Rd. with a Secure Entrance. Laundry facilities, inside bike storage, and a window air conditioner are provided. Street parking or paid parking is available. The Bus Line Transit # 3, is on the corner of Richmond steps from the front door.$420.00 per mo. plus utilities. We recently received a post card from a woman visiting the area. Great Things Happening in 2011! Happy New Year Ford City! 2010 was a great year and we ended it on a high note with our fantastic 1st Annual Ford City Winter Wonder Festival! 2011 is bringing great new ideas and projects which will be started hopefully this Spring. If you have any new ideas or want to meet your fellow neighbours, please come out to the Ford City Residents in Action meetings. You can always contact us at the office or by email. We met many new people at the Winter Fest and we hope to see some more new faces this year!